A serious vulnerability has been announced for Adobe Flash Player. This is being exploited in the wild, and an attacker could take control of an affected machine. Adobe has released a new version of Flash Player to address this. ITSS will be upgrading campus computers to the latest version starting Monday, July 13th. 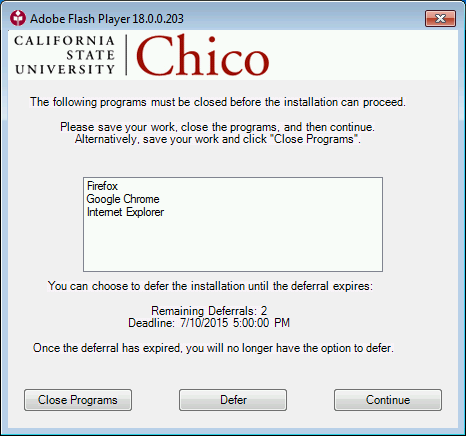 Users will have the option to defer the installation two times, until the installation deadline of 7/15 at 5pm arrives. Close any programs that are mentioned in the window, then click Continue. The upgrade will only take a minute or so. Work is scheduled to install a new battery backup system in the campus data center. To ensure safety for the electricians, the high voltage electrical panels in Butte Hall 4th floor will require a full shutdown during this maintenance window. Some services such as Exchange email and telephone service will be available. ImageNow services will be taken down at 4 PM on Friday to prevent loss of data and will be restored when all other computing services are restored on Saturday. Power will not be interrupted in other buildings on campus. On-campus workstation login and wired and wireless internet access will function except for Butte Hall. Restoration of all computing and network services is expected by 10 AM.